I think this post will be good who are working in REST api development. If you are in trouble with the security on REST api this will be really helpful to solve the problems. In above project structure I would like to explain the web.xml configuration as follows. 1. Define the spring root configuration. In the above code snippet you can see I have define the “contextConfigLocation” parameter which is pointing the “spring.security.rest.api” this would be the initialization point of configuration. So you have to make sure you give the correct package name where the spring configuration is located. This is the point that you have to manage your url. you can give what you want as a url and it will expose the defined apis followed by the above url. you need to exactly define the filter-name as “springSecurityFilterChain” and as a good practice we are defining the url pattern as “/*” even our api starts at “/api/*” because then we can control the whole domain when its required. Now I would like to go for the most important part of this project that is Spring security configuration. Lets see the webSecurityConfig.xml which is located at class path. 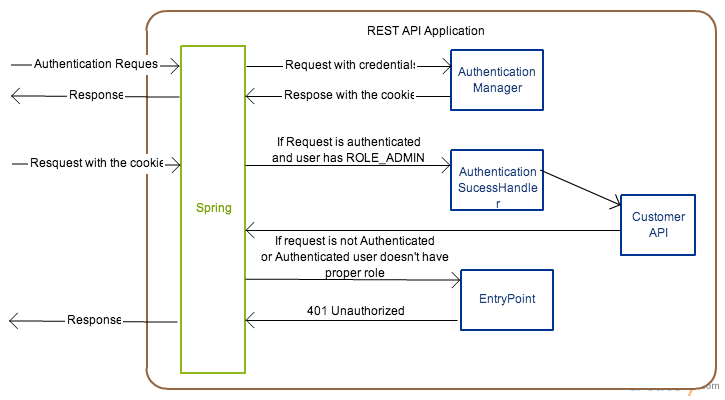 In the above xml file I have defined the entry point as “restAuthenticationEntryPoint” with the success and failure handler what it means, in the spring context entry point is used to redirect the non authenticated request to get the authentication. In REST Api point of view this entry point is doesn’t make sense. As an example If the request comes without the authentication cookie application is not going to redirect the request to get the authentication rather sending the response as 401 Unauthorized. * the request dosn't have the cookie then we send the unauthorized response. Above xml snippet is represented the authentication manager configuration. Here I have used the default authentication manager which is coming with the spring security framework but in the realtime application this authentication manager should be custom and it should be provided the user authentication with existing database. I’ll discuss the custom authentication manager configuration in different blog post. With the default authentication manager you need to define the users in this xml. You can see here I have defined the two users with the different roles. Make sure that you have configure the “global-method-security” because this is the tag that we are going to say that security roles configuration on resources is in annotation otherwise annotations will be ignored. Now I’m going to explain the SpringSecurityConfig.java class. This is the class that we are exposing the security configurations to the spring framework. 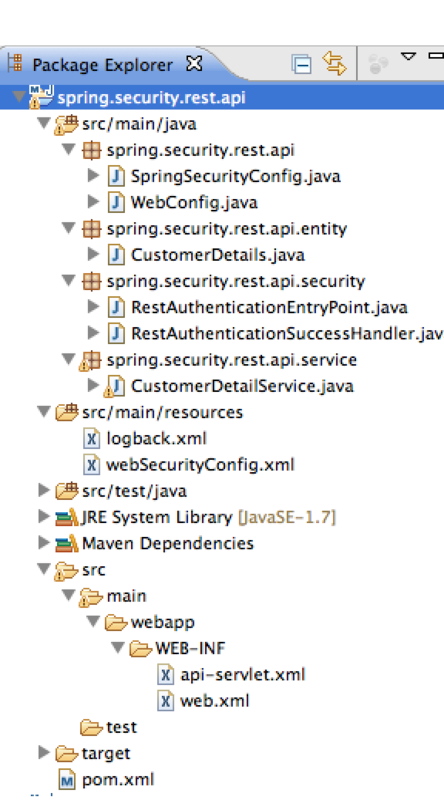 The following class WebConfig.java is the one which is going to expose the rest endpoint. We need ti always point the api implementation package in component scan annotation. You can see I have defined the secure role on top of the class that means this api is going to be available only for who has permission of ROLE_ADMIN. Lets go to look at how to actually work this web service. First of all you need to build this application and run on the tomcat. 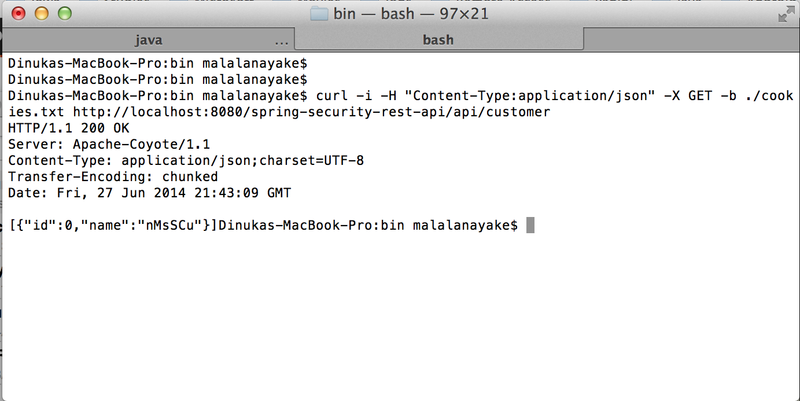 Then open the command line and do the following curl command to get the cookie. 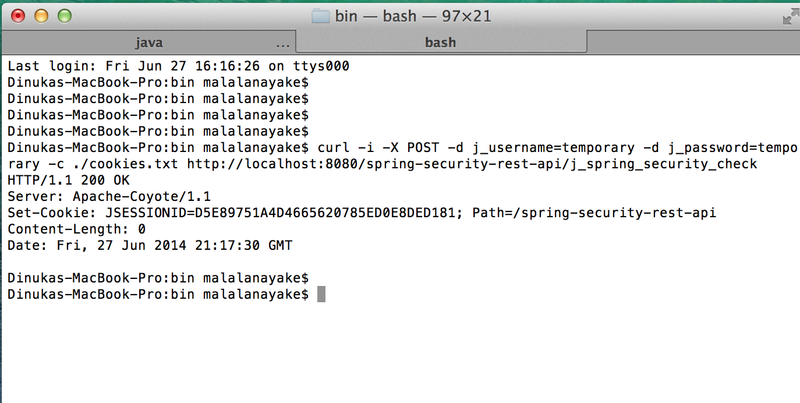 “j_spring_security_check” is default web service that expose from spring framework to get the authentication cookie. Now you can access the service as follows. Now think about the negative scenario. If you going to access the service without proper authentication you will get 401 Unauthorized response. I tried running this project. I am able to run first curl command and the cookies file is getting generated. Kindly tell how to proceed. Can you check whether your request has any additional space or newline? If you are directly coping this command you can see the double quotation marks are different than the normal double quotation you need to replace the correct double quotation marks and invoke. Put a “space” between “Content-Type:” and ” application/json”. Me too. I have a error about request. What is your error ? So you can pass the Authorization parameter in the request header. Thank you, very nice contribution! i was looking for something like this!!! Hi malalanayake, Thanks for the nice article..! I have imported this project into eclipse and use tomcat 7. Could you guide me how will I run this project in chrome rest client. Check your username password encoding because if you didn’t do correctly then app cannot authenticate and authorized your credentials. Next thing is you need to check your UserDetails implementation if you not sure about that you can remote debug your application and see whether its going to be hit or not. to get list of customers in android. I have tried a lot but i am not getting success. As i am new to REST security. Please can you help me how to go ahead. We are having an issue with a REST API deployed on a tomcat server. We use spring tool suite authentication but for some reason on an initial request (GET/POST) the user will always get a 401 authorization error even if the credentials are included. I have tried to debug but cannot trace where the source of the error is occurring but after an initial 401, it will work fine unless there is along period of inactivity. 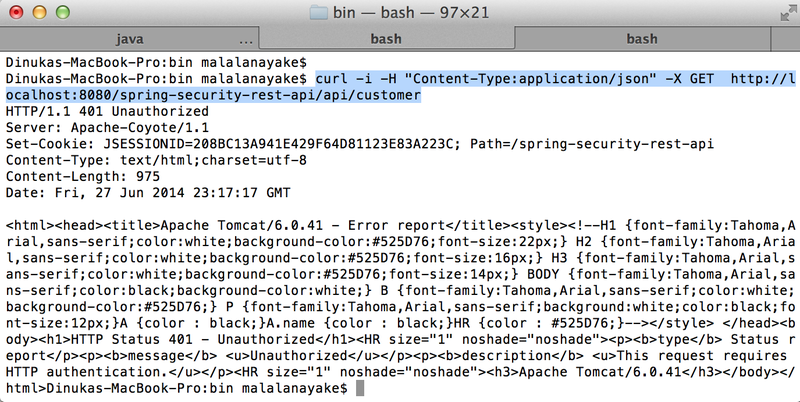 I am not even sure how to debug the spring USERDETAILSService library. Do you have any suggestions?